Battlerite Is Free To Play November 8 | Nerd Much? "We are super excited to enter ‘A New Era’ with Battlerite." Stunlock Studios is proud to announce that their game, Battlerite, will finally be leaving Steam Early Access. The game will launch November 8, 2017 as completely free to play. Before the launch, however, Stunlock will be holding a sale for the Early Access version at $9.98 USD, 50% off from the original price of approximately $20 USD. The sale will start September 25 and end October 1. Just in case you really can’t wait to play Battlerite. To save some confusion, though the studio is calling this sale a “Free Week,” the game will not be free until the November date. I’m fairly sure they just fumbled their wording and something got lost in translation, as they are based in Sweden. The developers are also happy to reveal that they’ve had over 1 million downloads since the launch of Battlerite into Early Access. Game director Peter Ilves weighs in on the matter, stating that “we are super excited to enter ‘A New Era’ with Battlerite” going free to play come November. The purpose of the sale, according to Ilves is to “give new players a taste of what they can expect” in the full game when it launches. Confusing, I know, but that’s what the press release says. So if you’re a really big fan, by all means fork over the 10 bucks. If you’re not, I recommend a little patience and waiting for November 8 to come around and see what happens then. It’s only a few months away, we’ve waited plenty longer for far larger games. 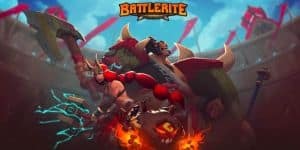 Battlerite is a PvP arena brawler with plenty of content upcoming in the schedule, like a Prehistoric Event that will feature dinosaurs as mounts and prehistoric weapons, a Winter Event that includes fur-lined outfits and a new champion, and four new champions by the end of 2018. Between Overwatch, Gigantic, and Battlerite, it will be tough to choose the right brawler for you. But at least both Gigantic and Battlerite are free to play, so there’s no harm in trying them out.